Here's a breakdown of the tariff highlights courtesy of Bloomberg. Some materials for pharmaceutical manufacturing will also be subject to zero tariffs, and taxes on high-tech imports will be set "relatively low," including at 1 percent for a type of generator for aircraft, and 5 percent for a type of welding robots used in car assembly lines. The ministry said MFN tariffs will be further cut for a wide-range of information technology imports starting from July 1, 2019, including for medical diagnosis machines, speakers and printers, according to a separate table on its website. Imports from nations that have reached a trade pact with China will be levied at the rates agreed by both sides. China’s bilateral deals with New Zealand, Peru, Costa Rica, Switzerland, Iceland, South Korea, Australia, Georgia already included promises to further lower tariffs in 2019, as does the Asia-Pacific Trade Agreement. Imports from Hong Kong, Macau will also enjoy lower taxes. China's stated plans to liberalize its economy could help improve the chances for an enduring trade pact with the US, as one of Trump's central demands is that the Communist Party take steps to narrow China's trade surplus with the US. 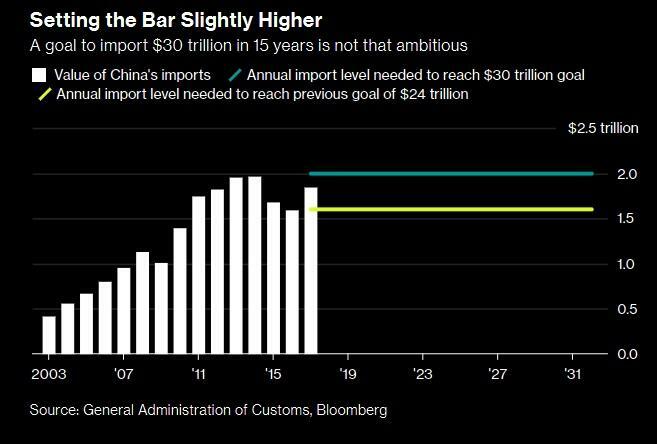 Then again, China has a long and storied history of promising to open up its markets - a process which created holes in its storied captial account firewall; whether it actually follows up on them has been a different matter entirely.